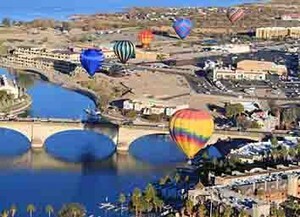 When most people think of Lake Havasu, they think of a place to spend a wonderful vacation. While there are many great reasons to vacation here, there are plenty more reasons to live in Lake Havasu. In addition to all the water sports available on the crystal blue waters of the lake from your Lake Havasu waterfront real estate, you'll also find great restaurants and an active community life. The cycle of annual events are beloved by all who live in Lake Havasu City. In February, sample the best chili at the Chili Society Cook Off, then watch the Havasu Classic powerboat races from your Lake Havasu waterfront real estate. Memorial Day, Independence Day, and Labor Day are all celebrated with style, too! Everyone who owns Lake Havasu real estate comes together for the fireworks, parades, and picnics at the lake. In December, residents attend the elegant Lake Havasu home and garden tour. Our thriving arts scene is another reason to live in Lake Havasu. GraceArtsLive was established in 2007, and it’s been the center of dance and theatre performances since. Local actors and musicians perform, with support from professionals from Los Angeles. Start Searching for the perfect Lake Havasu waterfront Real Estate today! You’ll be investing in a beautiful place to live, as well as a fun and active lifestyle. Our website features the newest Lake Havasu homes for sale, updated daily AND you can save your searches. Saving your searches allows NEW properties that meet your specifications to be emailed directly to you as soon as they come on the market. Let your home search be done for you with our amazing search features. For the past 7 years, Realty ONE Group has been recognized as one of the Inc. 500's fastest growing companies. Realty ONE Group, is 100% debt-free and believes in putting clients & agents first. Realty ONE Group Mountain Desert is ready to help you find your dream home in a low-pressure, friendly and helpful manner. Begin your home search today with the help of our experienced Lake Havasu Listing Agents, in Lake Havasu City, Flagstaff, Cottonwood, Prescott, Sedona and Chino Valley. Considering relocating? New to Lake Havasu? Click here to download our newly updated relocation guide and learn all that Havasu has to offer! Presented to you by your Lake Havasu listing agents, The COLLINS TEAM.